Delinquencies soar past Financial-Crisis peak at the ca. 5,000 smaller US banks, and these are the Good Times. What’s going on? The delinquency rate on credit-card loan balances at commercial banks other than the largest 100 – so at the nearly 5,000 smaller banks in the US – rose to 6.2% in the second quarter. This exceeds the peak during the Financial Crisis by a full percentage point and was up from 4.0% a year ago. But for the largest 100 banks – which carry the majority of the credit-card loan balances – the delinquency rate was 2.4% (seasonally adjusted), the Federal Reserve Board of Governors reported Tuesday afternoon. So what is going on here? A bank classifies credit card balances as “delinquent” when they’re 30 days or more past due. The rate is figured as a percent of total credit card balances. 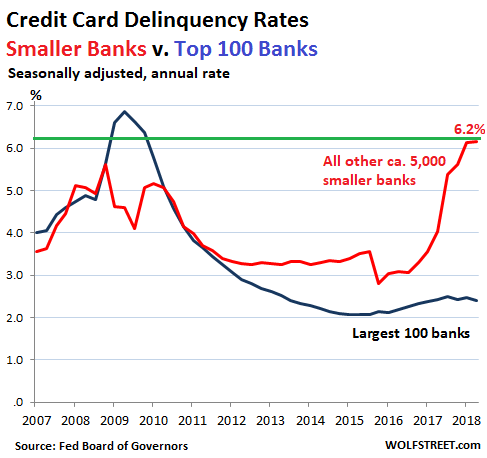 In other words, among the smaller banks, 6.2% of the outstanding credit card balances are now delinquent. Some customers are able to catch up with their minimum payments, and their credit card balances are removed from the delinquency basket. Others are not able to catch up, and the bank tries to collect what it can. It then moves the balance out of the delinquency basket into the charge-off basket – when the loan is “charged off” against loan loss reserves. These charge-offs among the largest 100 banks in Q2 rose a fraction year-over-year to 3.6% (seasonally adjusted). Note that both charts above are about on the same scale, with the delinquency rates lower than the charge-off rates as delinquencies get moved out of the delinquency basket and into the charge-off basket. The charts above show just how badly the largest 100 banks had gotten hit with losses on their credit card balances during the Financial Crisis as consumers, many of whom had lost their jobs, could no longer keep up with their minimum payments. At the same time, the smaller banks had experienced smaller losses. This was a lesson for those big banks. Since then, their underwriting has become tighter, and their marketing has been focused on the best potential customers that they’re luring with big cash-back offers, juicy frequent flier credits, and other incentives. 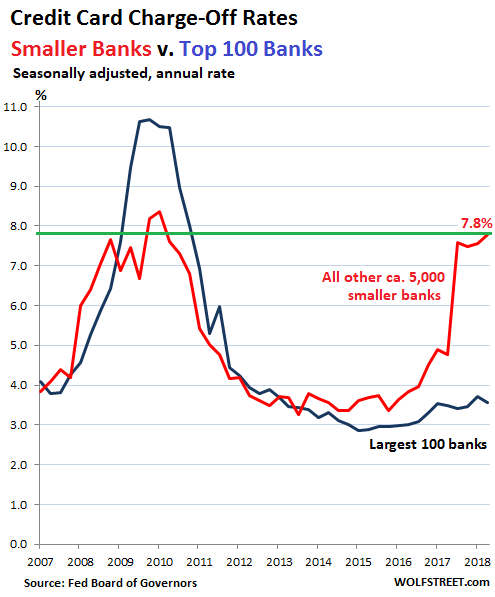 Smaller banks can’t offer those kinds of goodies, and cannot compete on that level, and so they marketed to a particularly profitable group, consumers with lower incomes, no savings, and weaker credit – many of them with subprime credit ratings – that they charged stupendous interest rates, sometimes exceeding 30%, creating a situation where consumers can’t even keep up with the interest charges. Profits were initially huge, but so is now the hangover – see the delinquency and charge-off rates above. These losses on credit card loans at the smaller banks aren’t triggered because people lost their jobs in a recession. The economy is as strong as it has been in years, and people are working. These losses are happening during good times! But the subprime segment of credit cards is concentrated at smaller banks because they targeted those customers to maximize their profits, and that subprime segment of customers is running into difficulty not because they lost their jobs, but because they borrowed too much at interest rates that are too high because the banks got too greedy with their most vulnerable customers. Credit-card loans amount to about $1 trillion. The nearly 5,000 smaller banks hold only a small portion of it. And some of that portion is curdling. This does not jeopardize the financial system. But it does show that among the most vulnerable consumers, the borrowing binge is hitting limits. Credit begins to unravel at the margin.